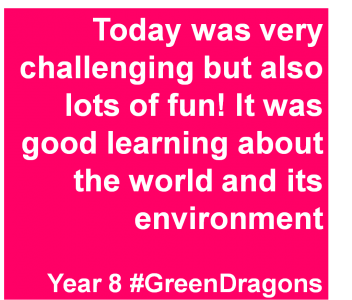 This month we’ve been working in London delivering our Green Dragons KS3 Enterprise and Global Learning Challenge to hundreds of Year 7 and 8 pupils across London. And what a fantastic time we have had! We also welcomed into our team two new mentors: Zenzo, originally from Zimbabwe and now researching Innovation and Sustainability for International Development at the Science Policy Research Unit (SPRU) in Sussex, Brighton. And Ilga, originally from the Ukraine and also a graduate of SPRU, now working in events management in the UK. 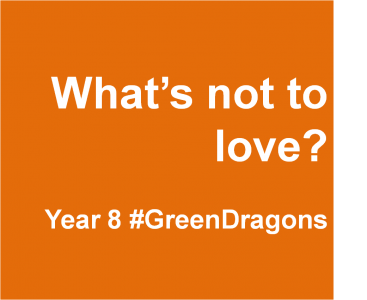 Green Dragons offers links across the curriculum to Science, Geography, Design and Technology, Citizenship, Art and Business Studies as well as supporting SMSC and PSHE. Each problem-solving ‘mission’ within the challenge is designed for students to lead their own learning and produce professional “pitches” to demonstrate this. Among the winning ideas from Year 7 were innovations for water sanitation (Goal 6) using shoes, a toy powered by kinetic energy (Goal 7) that warms up as its played with – a modern take on the ‘hot water bottle’ and even an education game that teaches young children about the topic and importance of sustainability! But above all, the students were enthusiastic and positive in their feedback, recognizing the key employment skills they had practiced throughout the day, their strengths within these and where they needed to improve. As part of our monitoring and evaluation process we collate feedback from all participants (that can be hundreds per event!) and create easy to access data on employment skills and learning. It’s now the spring holidays here in the UK and we’ll be working on the finishing touches to our Creative Disruptors challenge ahead of the May launch. 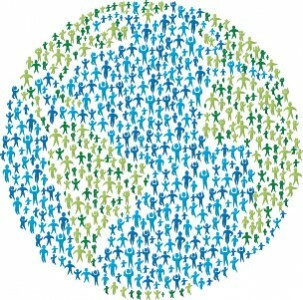 For up-to-date information on what’s happening, who with and how, check out our Global Education Initiatives site! 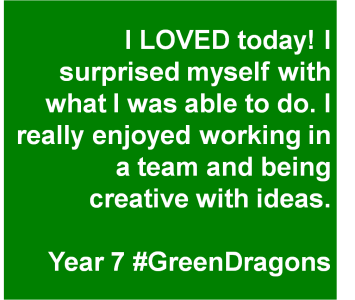 Over the past two weeks we’ve been working with students undertaking our Green Dragons enterprise and innovation challenge. Starting off in London and moving on to Oxford, we’ve been delighted to see some fantastic examples of creative thinking and problem solving come out of the workshops. Each team used their imagination and entrepreneurial acumen to produce innovative solutions to pressing global concerns. The winning team from Godolphin and Latymer school was ‘UnEarthed‘ – an ethical social enterprise which partners with food suppliers to sell unwanted ‘ugly’ fruit and vegetables in urban markets and schools, encouraging people to buy and eat healthy foods that would otherwise go to waste. In the UK, Tesco supermarket has just announced plans to eliminate 100% of its food waste by giving it to appropriate charities in the UK to use and consume. Meanwhile in Italy, the government has just announced it will be rolling out a law to make ALL supermarkets give unwanted food to the needy! Following an earlier lead taken by France. Our education partner ThoughtBox was also covering waste within its January curriculum, providing resources for students to explore and critically question the causes and effects of waste across our planet. And if that wasn’t enough, we were delighted to watch the first clip of the upcoming film to The Plastic Project by our friend Tim Nunn Photography. Tim’s adventures into surf, photography and the crusade to fight and reduce plastics in our oceans was highlighted last September by BGE when we went to hear his fascinating talk at Jimmy’s Iced Coffee. Whilst The Plastic Project is an exemplary example of individual and collective action, we want our students to think critically about the causes of waste – especially in the production and packaging of products. After all, if it wasn’t for businesses selling us things in plastic, we wouldn’t have quite the problem we do in the 21st century. 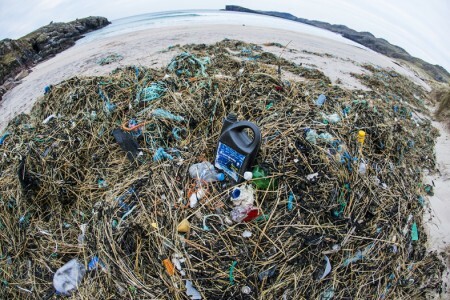 It’s only by unpacking the packaging crisis can we get to see and then understand where the problems occur and begin putting business back together in a more ethical way. 1. Acknowledge the problems associated with unethical and unsustainable business practice. 2. Accept that there’s an individual responsibility to reducing waste (food and plastic) and that collectively, the best solutions can be found to correcting this. 3. Act to change the direction of business impact by exploring how skills in design, technology and communication (such as marketing, advertising, PR, public speaking…) can all help to shape a more sustainable planet. We’re looking forward to working with lots more students this summer and seeing if any more governments and businesses take steps to address these critical issues! (Credit to Tim Nunn Photography for the featured image). This East African story about the innocence and power that children possess was recorded at the beginning of the twentieth century in Benaland, Tanganyika (now Tanzania) by Pastor Julius Oelke of the Berlin Mission Church. The beginning line ‘we do not really mean’ is the line used in Ashanti (Ghanaian origin) of every folk tale. 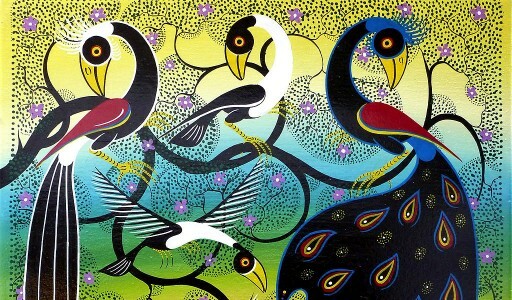 The accompanying pictures are what are known as ‘Tinga Tinga’ style paintings, a Tanzanian 20th Century art form often depicting magical birds and and local community life. We do not really mean, we do not really mean, that what we are going to say is true…. One day, a strange bird arrived in a small village that nestled among low hills. From that moment on, nothing was safe. Anything the villagers planted in the fields disappeared overnight. Every morning there were fewer and fewer sheep and goats and chickens. Even during the day, while the people were working on the lands, the gigantic bird would come and break open their storehouses and granaries and steal from their winter food supplies. The villagers were devastated. There was misery in the land – everywhere was the sound of wailing and the gnashing of teeth. No one, not even the bravest hero of the village could get his hands on the bird. It was just to quick for them. They hardly ever saw it: they just heard the rushing of its great wings as it came to perch in the crown of the old yellowwood tree, under its thick canopy of leaves. The headman of the village tore out his hair in frustration. One day, after the bird had plundered his own livestock and winter supplies, he commanded the men to sharpen their axes and machetes and to move as one against the bird. “Cut down the tree; that is the answer”, he said. With axes and machetes ground to gleaming razor edge, the men approached the great tree. The first blows landed heavily and bit deep into the flesh of the trunk. The tree shuddered, and from the thick tangled leaves of its crown the strange and mysterious bird emerged. A honey-sweet song came from its throat. It reached into the hearts of the men and spoke of fabulous, far-off things that never would return. So enchanting so the sound that the machetes and axes fell one by one from the hands of the men. 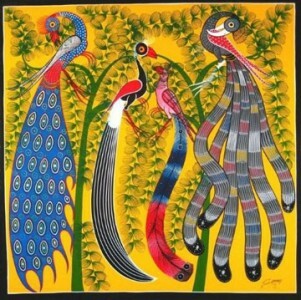 They fell to their knees and stared upward in longing and yearning at the bird that sang for them in all its brilliantly coloured splendor. The men’s hands became weak. Their hearts became soft. No they thought, so beautiful a bird could never have caused such damage and destruction! And when the sun sank red in the west they shuffled like sleepwalkers back to the headman and told him there was nothing, but nothing, that they could do to harm the bird. The headman was very angry, “then the young men of the tribe will have to help me” he said. “Let the youngsters break the power of the bird”. The next morning the young men took their gleaming axes and machetes and set off for the tree. The first blows again landed heavily, biting deep into the flesh of the trunk. And just as before, the green canopy of the tree opened and the strange bird appeared in all its multihued finery. Once again a most wonderful melody echoed across the hills. The young men listened enchanted, to the song that spoke to them of love and courage and of the heroic deeds that awaited them. This bird could not be bad, they thought. This bird could not be wicked. The young men’s arms became weak, the axes and machetes fell from their hands, and they knelt like the older men before them, listening in a trance to the song of the bird. When night fell they stumbled, bewildered, back to the headman. In their ears still sounded the enchanting song of the mysterious bird. “It is impossible” said the leader of their group. “No one can withstand the magical power of this bird”. The headman was furious. “Only the children remain,” he said. Children hear truly and their eyes are clear. I will lead the children against the bird”. 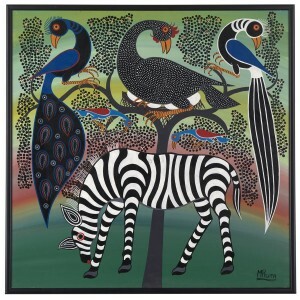 The next morning the headman and the children of the tribe went to the tree where the strange bird was resting. As soon as the children let the tree feel the bite of the ax, the leafy canopy opened and the bird appeared just as before blindingly beautiful. But the children did not look up. Their eyes stayed on the axes and machetes in their hands. And they chopped, chopped, chopped to the rhythm of their own music. The bird began to sing. The headman could hear that its song was beautiful beyond compare, and he could feel the weakness in his hands. But the children’s ears could hear only the dull, regular sounds of their axes and machetes. And no matter how enchantingly the bird sang, the children continued to chop, chop, chop. Eventually the trunk creaked and cracked apart. The tree crashed to the ground and with it fell the strange and mysterious bird. The headman found the bird where it lay, crushed to death by the weight of the branches. From everywhere the people came charging. The hardened older men and the strong young men could not believe what the children with their thin arms had accomplished! That night, the headman declared a great feast to reward the children for what they had done. “ You are the only ones who hear truly and whose eyes are clear”, he said. “You are the eyes and ears of our tribe”. “Because a story is a story; and you may tell it as your imagination and your being and your environment dictate; and if your story grows wings and becomes the property of others, you may not hold it back. One day it will return to you, enriched by new details and with a new voice”. (Nelson Mandela).